The World’s Best Bar Dandelyan has been reborn as Lyaness, and it’s not just the cocktails that are being shaken up. Drinks maestro Ryan Chetiyawardana, whose multiple accolades include International Bartender of the Year, focuses on service as much as what’s in the glass, and has little time for mixologists who leave guests waiting while they create the perfect drink. The new Lyaness, in the same space as Dandelyan, in the Sea Containers London hotel, revolves around just seven flavour groups, with three drinks options for each. The relatively short list has enabled Chetiyawardana, who also goes by the name Mr. Lyan, to take time to develop each drink and to streamline service in order to cut serving times. He’s developed a system based on the practice in professional kitchens, where much time is spent on preparing and organizing the ingredients ahead of service, the so-called mise en place, so that they can be assembled at speed once an order is received. Chetiyawardana has in the past been known for some quirky and challenging cocktails with unusual ingredients such as snails. At his first London bar, White Lyan, he banned all brands and all perishables, including ice and fruit. But he’s constantly evolving, almost routinely closing venues and reinventing them. At Lyaness he’s eschewed the practice of grouping cocktails around particular spirits and zeroed in on core categories: Infinite Banana; Purple Pineapple; King Monkey Nut; Onyx; Aromatised Milk Wine; Old Fashioned Whisky; and Ultra Raspberry. Chetiyawardana dissects and explores ingredients, rather than just reproducing known flavours. So his raspberry, for example, reflects the fact the berry shares characteristics with more savory cousins such as tomatoes. It’s less sweet and fruity than you might expect. Onyx is a collaboration with Empirical Spirits distillery in Copenhagen, building on Helena, a double-fermented clear koji spirit. One option is the Rosa Daiquiri, which features wheat vodka, blackened koji berries and a birch-and-hibiscus kambucha. It’s light and fresh and not too sweet. There is a very noticeable chocolate flavour, mixed with the tartness of fresh lime juice. “When we first opened Dandelyan, we were looking at this idea of being inspired by nature,” he says. “How could we delve into the wonders of our ingredients to reflect something unusual? We were very fortunate to have people that were excited by the idea of taking something weird and wonderful but lots of my friends who would cook and would drink amazing wines were still put off the idea of having a cocktail. 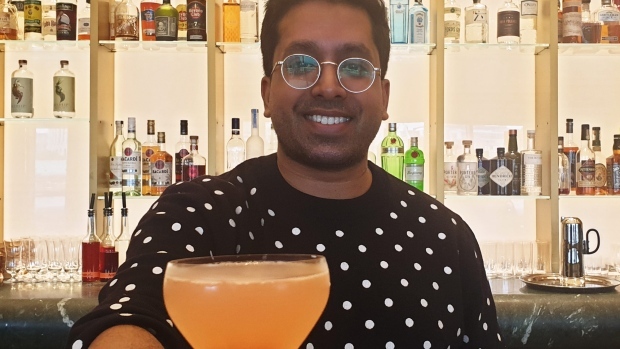 If you are not in London and want to try Chetiyawardana’s cocktails, he is opening bars this year in Amsterdam, and Washington, D.C.